Livent, spun-out of FMC Corporation, is a pure play lithium producer based out of the Unites States with production facilities in Argentina. The Company represents a classic spin-off opportunity with a discounted valuation to a strong business model prime for growth. 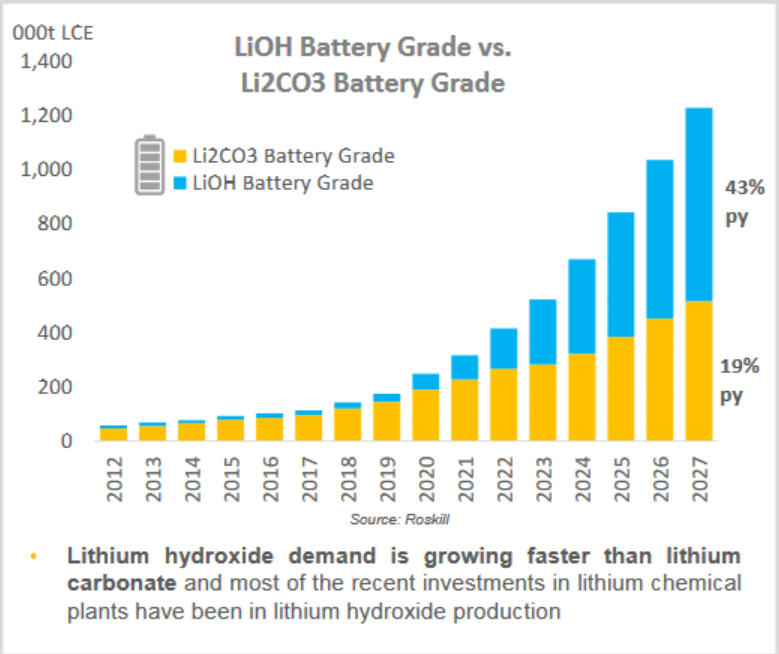 Market demand for Lithium Hydroxide is expected to drastically increase as OEM’s transition to High Nickel Cathode Batteries representing a tremendous opportunity for the Company. Livent’s advantageous positioning within the market will allow the Company to capitalize on this growth and protect it from price and supply fluctuations. As of April 7, 2019, Livent (LTHM) trades at $12.09 per share with a market capitalization of roughly $1.75B. The Company is currently trading at a discount of ~30% compared to its IPO price and is near the bottom of its 52-week range of $11.55-$19.90. Management has guided positively after the end of FY’18 and our team believes at its current price, Livent represents a tremendous buying opportunity. Livent, or the “Company” or “LTHM”, is a fully integrated Lithium production company recently spun out of FMC Corporation. The Company represents the largest investable pure play lithium producer within the United States. Livent primarily focuses on extracting Base Lithium compounds from their brine operations at the Salar Del Hombre Muerto in Argentina. These base compounds are then shipped globally to the Company’s manufacturing facilities located in UK, USA, China, and India where they produce Performance Lithium Compounds including High Purity Lithium Metals, Butyllithium, and Lithium Hydroxide. Use cases and applications of each compound are included in the figure below. 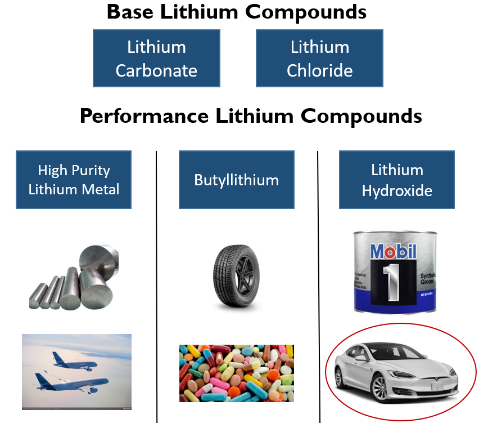 The value and strategic advantages of the Company pertain to their Lithium Hydroxide production for EV battery applications. LTHM plans to spend ~$700M in discretionary capital expenditures over the next seven years to nearly triple production capacity and meet expected demand for EV battery applications. Strong impending demand in this space will allow the Company to realize scale prior to demand inflection and capitalize on a market with an expected CAGR of ~35% over the next 10 years (Source: S1). Livent’s recent spin-off from FMC, as well as changes in the Company’s ownership and management incentives, allow us to further explore the Company’s value proposition. Before diving deeper into Livent’s value proposition, understanding the outcomes of past spin-offs is important. A strong proponent of value-oriented spin-offs, Joel Greenblatt, strongly outlines that spin-offs generally beat the market. His claims are supported by statistics that indicate spin-off companies perform ~30% above the S&P 500 during their first three years in operation. The ultimate goal of a spin-off is to unlock value through separation from the parent company; it is therefore crucial to identify the factors for early under performance. It is not uncommon for fundamentally sound business to trade at relative discounts to implied valuations for up to twelve months after the spin-off due to steep sell offs and lack of interest in the newly formed entity. To further expand on the concept of unlocking value, it must be noted that Livent’s spin-off was a purely future-oriented and management-based decision. Livent as a new entity will now undertake aggressive capital expenditures, aimed at providing the Company with additional Lithium production and manufacturing capabilities to meet demand expectations in the EV market. The Company’s leading low-cost Lithium production is set to triple within the next 7 years with sources claiming the manufacturer’s Salar del Hombre facility operates lowest cost of production globally (S1 and Roskill). Livent’s carve out IPO was priced at $17.00 on October 11th, 2018, with FMC holding 86% of shares outstanding. However, this price quickly descended to $11.55 in early March, exactly in line with FMC’s planned distribution of Livent shares to FMC shareholders. This distribution fully separated the two entities as of March 1st, 2019. Our team believes LTHM is valued well below its intrinsic value when analysis was completed and much of our thesis points have not been truly appreciated or priced in. Notable to this spin-off, was strong management turnover from FMC corporation. Paul Graves, previously CFO of FMC, now serves as the CEO of Livent. Other notable management turnover includes Gilberto Antoniazzi and Thomas Schneberger, both executives in their respective divisions at FMC. In addition, we find that all three are receiving over 50% of compensation in the form of stock options and RSU’s, with Paul Graves specifically receiving 68% of all compensation in this form. These incentive packages are largely considered a telltale sign of a promising business opportunities, especially in the case of spin-offs. Size of the global market for electric vehicles are expected to grow at a CAGR of ~22% from FY’18-FY’25 (Source: Allied Market Research). Consumer preferences, in combination with government regulation, are driving demand for low-emission, fuel-efficient, and high-performance transportation. 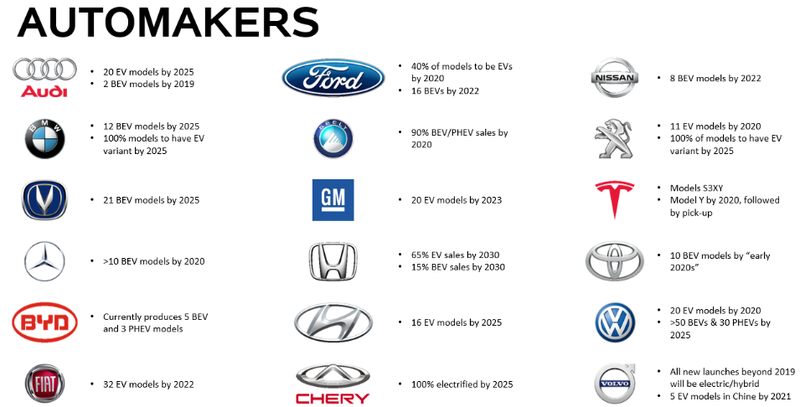 These trends are propelling the electric vehicle market, and its associated supply chain. 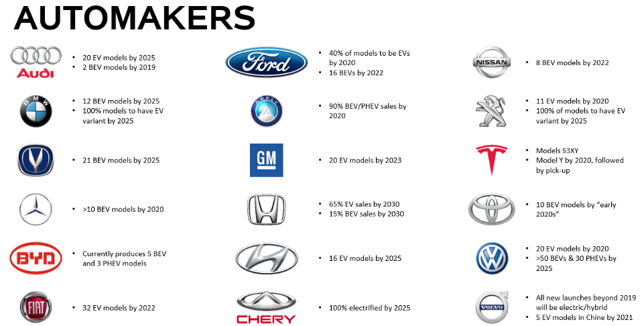 Global automakers and OEM’s are committed to the transition from ICEs to BEVs and PHEVs. This commitment can be observed by several automakers introduction of EV models, or pledges to phase out ICEs completely. Lithium suppliers should be well positioned to deliver strong results as Lithium-ion batteries are the preferred battery technology to be implemented in EVs. Livent’s world-class production capabilities and advantageous Argentinian legislation renders their brine operations at Salar del Hombre Muerto the world’s lowest cost production facility. The recent spin-off from FMC and low debt profile, will allow the Company to pursue expansion projects and bolster production capacity. Management projects expansion of Lithium Carbonate from 18 kMT in 2018 to 60 kMT in 2025, and expansion of Lithium Hydroxide from 18.5 kMT in 2018 to 55 kMT in 2025 (Source: 10K). Livent is well positioned to serve current and future demand from OEM’s from their cost advantageous production and expansion efforts. Livent’s transition to supply Lithium Hydroxide is directly the result of a technology shift within battery Manufacturers to High Nickel Cathode Batteries. Historically, Lithium Carbonate has been the main compound used within battery manufacturing largely due to its low cost. However, these batteries are characterized by low driving ranges per charge. Per a McKinsey research report, the two most pertinent characteristics of consumer resistance to EV’s is price and driving range. High Nickel Cathode Batteries, utilizing high grade Lithium Hydroxide, improve EV driving ranges drastically and will allow the OEM’s to address the widespread consumer concern. Livent’s plan to near triple the production capacity of high-grade lithium hydroxide to meet the OEM’s requirements will allow the Company to perfectly meet the dramatically expanding demand requirements. It should be noted the transition to high nickel cathode batteries to fit with OEM’s EV range priorities is a stage within the transitioning process of and ever improving battery capabilities. Battery chemistry is expected to change and provide the market with new generations of battery technologies. Although this rate of technological change in the battery industry may seem threatening to Livent’s lithium hydroxide operations, it should be noted that new battery technology takes approximately seven to ten years to develop and additional time for commercialization and implementation on a wide scale. Livent, has provided guidance to their increased R&D and work with manufacturers to improve technological capabilities and meet future product requirements. As we have discussed, the Growth in demand from OEM’s for specifically Lithium hydroxide in High Nickel Cathode batteries represent a significant market opportunity. 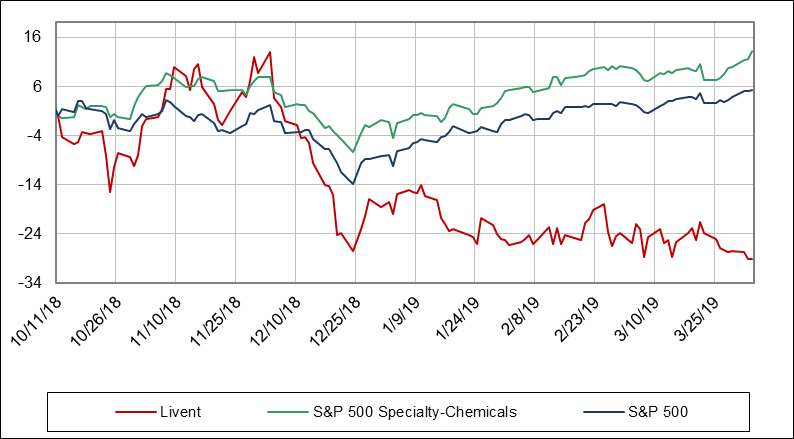 However, market sentiment on this topic focuses primarily on broader market pricing for these commodities and does not appreciate why Livent is less exposed to such pricing pressure. Firstly, OEM’s have become increasingly involved in the procurement process for Lithium Hydroxide in Electric Vehicle Battery applications along side the Cathode Manufacturers. This is due to the fact that Lithium Hydroxide is a critical input to battery functionality and longevity over time. Lithium Hydroxide Grade requirements differ among each OEM requiring each producer to curate specific Lithium Hydroxide grades for OEM use. This reduces the ability for larger conglomerates to truly benefit from Economies of scale as the product is no longer “commoditized”. The reasoning behind this push stems to the OEM’s commitments on behalf of their customer. Ultimately, the OEM’s are required to sign off on 8-10 year warranties on all their cars produced and the battery specifically represents an extremely costly part to replace if defective. 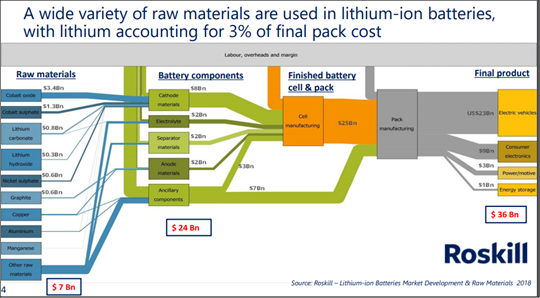 In addition, as shown in the Roskill Graphic shown below, lithium utilized within Batteries represents a mere 3% of total Battery production cost. Our team believes these factors will force OEM’s to focus greater effort on Quality and Consistency of Lithium Hydroxide rather than price. Considering these factors, Livent’s current customer and contract structure is extremely favorable for this situation. The Company’s most recent earnings call outlined their current contracts and future expectations, pointing out some key factors at play. Livent currently holds Contracts with their customers over roughly 2-5 year periods giving management strong guidance on future price and volume expectations. Management stated ~70% of 2019 volumes are under contracts of 2 years or more and this number is expected to rise over time. In addition, 80% of contracts were sold at prices equal to or higher than the previous year and these contracts prices are fixed throughout the fiscal year. We believe this goes directly against what the market is currently pricing in for this Company suggesting a misalignment of expectations and foreseeable reality. Management additionally suggested they are receiving inquiries for contracts they do not have the capacity for as of yet and revised their Performance Lithium Compound Revenue upward by 23% at the midpoint. These performance expectations absolutely do not warrant the steep sell-off we are currently witnessing and believe it represents a tremendous buying opportunity. Our team created a 10 yr forecast of operations aiming to derive growth through the Company’s capacity expansions provided through 2025 and assumed growth would slow for the remaining three years. These projections are based partly on management guidance and our additionally belief of the materialization of our thesis points. 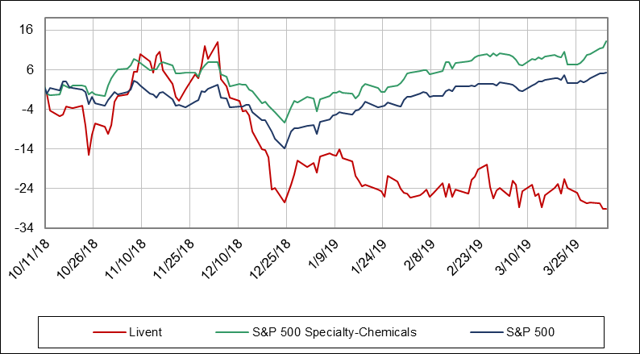 We assumed modest or flat pricing growth for all three major product lines, however, we believe this is conservative given management guidance of increased pricing in FY’19 of every Performance Compound product and Livent’s advantageous positioning in contract negotiations with OEM’s. We believe the market is not truly appreciating this fact and unjustly grouping Livent in with declining price expectations within the broader Lithium production market as supply grows. In addition, per Roskill, pricing of Lithium Hydroxide in the open market is expected to improve over time as demand will outpace supply additions in early 2020’s. Our team specifically forecasts Lithium Hydroxide to represent the main driver of growth for the Company which can be seen in the figures below. 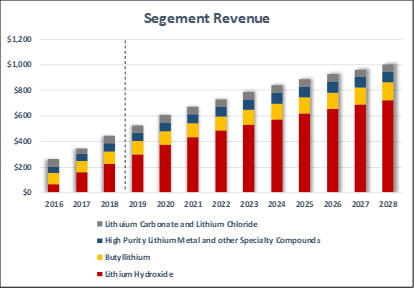 This is in line with management expectations that Performance Lithium Compounds will make up the vast majority of revenues going forward and the largest compound segment being Lithium Hydroxide. Based on our assumptions detailed above, we valued the Company using three major valuation techniques: discounted cash flows, trading comps, and precedent transactions. 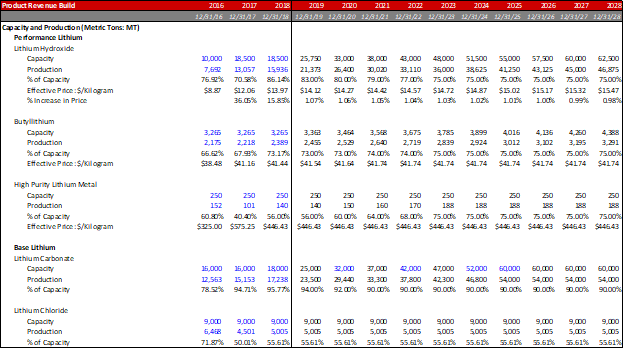 Included below is our DCF projections through FY’28. Most notably, our capital expenditure projections are provided by management through FY’25 with the remaining three years to be our projections. These projections take into consideration both discretionary and maintenance capex over the 10 year period. We believe a five-year DCF distorts the Company’s growth cycle and does not capture entirely the expectations of management and Livent’s potential. The 10yr DCF more completely encompasses the growth cycle and our belief that the Company’s fastest growth will occur between FY’21-FY’25 as demand is expected to hit an inflection point during that time frame. The companies included in our peer analysis were chosen individually based on their production capabilities and positioning within the Lithium production market. Notably, Albemarle represents the only other US based producer within this grouping. The producers chosen represents the bulk of the Lithium production market at ~80% when including Livent. Company is currently trading at an attractive relative valuation on the most applicable metrics, specifically, EV/EBITDA, EV/EBIT, and P/E. We believe the discount to its peer group is unjustified given the Company’s long-term demand prospects and positive contract terms. 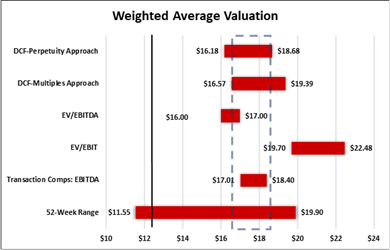 As previously mentioned, we used three valuation methods to arrive at our target price of $17.76 representing an implied gain of ~46% from the trading price of $12.09 at time of pitch. Our Valuation weighted more heavily towards our DCF valuation at roughly 60%, trading comps making up 30%, and recent transactions the remaining 10%. We believe these estimates are achievable and the Company’s outlook will continue to improve as clarity is provided about expansion progress. We see the largest risk for Livent to be associated with missed capacity projections provided in management guidance. Our assumptions are largely based on the Company reaching guided production capacities. These expansion projects are complex and technical, and the Company’s failure to meet projections would lead to significant loss of opportunities that would drive top-line growth. However, under our bear case assumptions: 10% capacity miss every year during the 10yr forecast, COGS rise 2.5%, and SG&A raises 1%; The Company is still priced at a discount of 10-20% to an implied intrinsic value. Changing subsidy policy by the Chinese government introduced uncertainties for Chinese EV manufacturers late in 2018, and this uncertainty affected Livent’s contract negotiations with Chinese manufacturers. Continued uncertainty in the Chinese EV market, might have an adverse effect on Lithium Hydroxide demand, which would hinder Livent’s growth opportunities. The government of Argentina is currently “friendlier” towards lithium producers and has not introduced heavy royalties on lithium production compared to their neighbor Chile. We expect this attitude to continue. However, Argentina will hold general elections in October 2019, and the outcome of the election might introduce change in legislation. In Conclusion, Livent represents an opportunity to gain direct exposure to the growing market for performance lithium compounds specifically for EV applications. 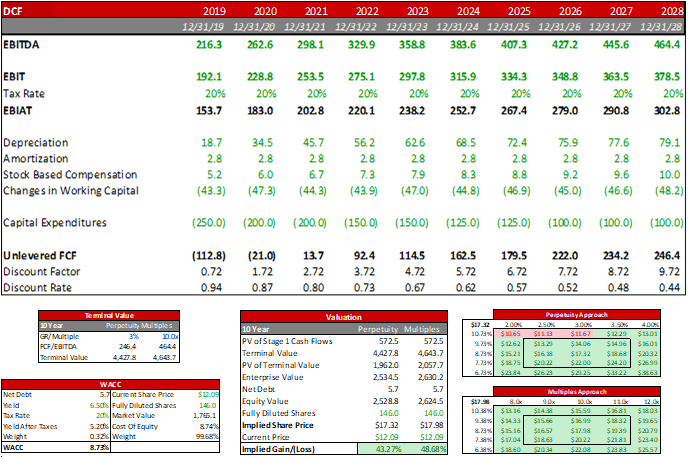 Livent’s spin-off from FMC Corporation and the selloff witnessed during Q1’19 represents a tremendous opportunity to buy a fundamentally sound business at a steep discount. The Company is advantageously positioned to benefit from the impending Lithium Hydroxide demand for High Nickel Cathode Batteries in EV applications. We believe this is a very compelling opportunity to invest in a Company prior to a demand inflection point expected to begin in FY’21. For these reasons, we re-assert our strong stance that LTHM is currently trading at a large discount to our target price of $17.64 and represents a tremendous buying opportunity. Disclosure: I/we have no positions in any stocks mentioned but may initiate a long position in LTHM over the next 72 hours. I wrote this article myself, and it expresses my own opinions. I am not receiving compensation for it (other than from Seeking Alpha). I have no business relationship with any company whose stock is mentioned in this article. Additional disclosure: While the fund itself does not own shares of LTHM, certain contributors to the pitch and model do own the stock personally. Disclosure: I/we have no positions in any stocks mentioned, but may initiate a long position in LTHM over the next 72 hours. I wrote this article myself, and it expresses my own opinions. I am not receiving compensation for it (other than from Seeking Alpha). I have no business relationship with any company whose stock is mentioned in this article.